with Raw Shea Butter for Extra Moisture! 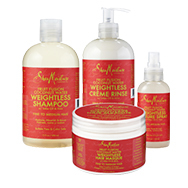 A range of products enriched using the best parts of coconut and exotic Acacia Senegal. This nourishing collection boasts a blend of 100% Virgin Coconut Oil, Coconut Milk and Coconut water which moisturise and soften. Ideal for all hair and skin types, the range includes shampoo, conditioner and leave conditioner for the ultimate haircare trio. The perfect collection for smoothing and taming your tresses. Ideal for use on fine, frizzy, straight or wavy hair, this argan oil and almond milk blend offers a natural way to fight the frizz. Lightweight so not to weigh down the hair, almond milk combined with argan oil works to smooth and tame frizz by sealing hair cuticles, protecting against humidty, softening hair and adding shine. 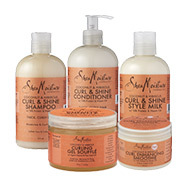 Working to heal and rejuvinate hair Shea Moisture's Raw Shea Butter collection nourishes hair and skin with extreme moisture, vitamins and fatty acids. Formulated with certified organic Raw Shea Butter which works to deeply penetrate while nourishing dry skin on the scalp and body, this family recipe enusres to use only the purest Raw Shea Butter. Famed for its rich, nouishing natural emollients which work to banish chapped skin and leave hair and skin soft, nourished, smooth and conditioned, you'll soon wonder how you ever went without this healing range in your haircare collection. 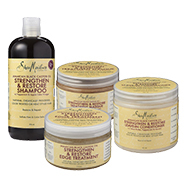 Helping to strengthen, grow and restore hair, Shea Moisture's Jamaican Black Castor Oil collection renews and fortifies hair while supporting healthy growth for all hair types. Perfect for hair that's chemically treated, heat styled, natural and transitioning, the nourishing formula replenishes dry, brittle and damaged hair with a unique blend of natural ingredients. Fortified with certified organic and ethically sourced ingredients, the formula features Black Castor Oil rich in omega oil which has reparative benefits for hair and scalp. Boosted with certified organic Shea Butter, hair is nourished by nutrient-rich fatty acids and vitamins to aid hair health. The formula also features Apple Cider Vingar, Rice Protein, Peppermint Oil and Coconut Oil, all with qualities that contribute to hair health, thickness, hydration and strength. Protecting hair and skin from harmful external aggressors such as pollution, humidity, dry air and UV rays, this luxurious formula helps to banish the frizz caused by these influences. Hydrating and softening the hair while replenishing and supporting natural moisture barriers, the formula helps protect hair and skin, preventing weakening of the natural protective barrier. A nourishing and enhancing range that's boosted with a blend of exotic fruit and floral ingredients, Shea Moisture's Coconut & Hibiscus range is an island-inspired line. Promising radiant skin and hair, the collection remedies dull and dry skin and works to tame frizz while defining and maintaining curls. Fragrant Hibiscus Flower and Songyi Mushrooms combined to tighten, tone, even and bright complexion. Rich Coconut Oil and Shea Butter penetrate scalp, hair and skin with restorative moisture thansk to a mix of intense emollients. Aiding in contouring, firming and smoothing skin and hydrating, nourishing and protecting hair, this fruit-infused collection is formulated with a blend of nourishing ingredients. Boosted with the antioxidant-rich Superfruit Complex, ingredients in the collection include Shea Butter, Marula Oil and Biotin to nourish and enrich dull and lackluster hair. Offering weightless hydration, this formula is powdered by a natural blend of Dragon Fruit, Lychee Berry and Green Apple Extrracts to revitalise fine, lifeless hair and dull skin. Further boosted by coconut water and certified organic Shea Butter, the deeply hydrating and ultra-lightweight collection will refresh and renew. Did we mention it smells scent-sational too? 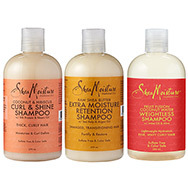 With an array of ranges boosted by nourishing natural ingredients and boasting catered formulations for all hair types and conditions, you're sure to find a shampoo to suit your needs in Shea Moisture's collections. With a collection to suit every hair concern and need, you're sure to find a conditioner that nourishes, hydrates and cares for your hair type in Shea Moisture's covetable collections. 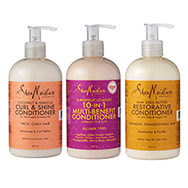 If you're in need of an extra dose of nourishment for your hair, you're sure to find a solution to your hair concern in Shea Moisture's range of natural formulations. Whether you're looking to fight the frizz, nourish transitioning hair or add a dose of radiance, Shea Moisture have got your hair covered. The Shea Moisture story began in the Bonthe village market, Sierra Leone, in 1912. A woman named Sofi Tucker began selling Shea Nuts at the market. By the age of 19, Sofi was a widowed mother of four and had begun selling Shea Butter, African Black Soap and her homemade hair and skin products all over the countryside. Sofi Tucker was the grandmother of Shea Moisture's creators and Shea Moisture is her legacy. 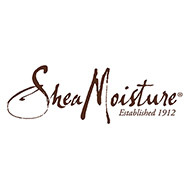 All Shea Moisture's products are natural, organic and susitainably-produced. 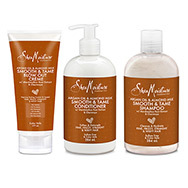 Striving to be sulfate and paraben free, Shea Moisture's products are never tested on animals. 10% of their Community Commerce sales also go to women-led businesses, to support communities that supply ingredients for their products or to support the Sofi Tucker Foundation. With products formulated from the best ingredients gathered from around the word, the brand believe the best in personal care and beauty should be accessible to all. 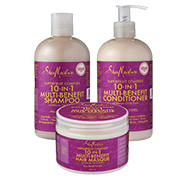 Their 100% Virgin Coconut Oil collection is perfect for providing everday hydration for all hair and skin types. Formulated using the best parts of the coconut alongside exotic Acacia Senegal, the blend's a firm favourite. Other ranges include Raw Shea Capuacu which hydrates and softens hair, replenishing and supporting natural moisture barriers to protect against environmental aggressors, and Raw Shea Butter which is enriched with rich, nourishing natural emollients to soothe and rejuvinate hair. Discover how shea butter can improve your hair and skin. Reveal your best hair yet.